With writers almost universally using computers, books have been getting longer and longer. When I began publishing in the 1970s, a full-length novel was usually between 70,000 and 80,000 words, but shorter novels often appeared. During that period word-length was often an issue with publishers, or at least it was in my experience, with pressure brought to bear to make books shorter. For instance, when I delivered my fourth novel, The Space Machine, which I now know was about 120,000 words, my publishers in both the UK and the USA demanded I cut it down by about a third, mainly to save themselves some of the cost of production. The American publisher even went to the trouble of commissioning an outside editor to read my allegedly long-winded manuscript and suggest ways of cutting it down to size. I wondered at the time if the editor’s fee was going to be larger or smaller than the saving they were hoping to make – in the event it was academic, because after I had read his suggestions I declined gently and of course politely. The UK publisher, Faber, suggested some editorial amendments to the opening chapters. While I was looking at these suggestions, and because I am helpful by nature, I took the opportunity to make a few silent excisions as well, harmless to the story or characters. These cuts overall reduced the length of the novel to just over 117,000 words, but I think no one at the publisher noticed. Their requests for me to make more radical cuts continued for several weeks afterwards, seeming to increase in desperation. The culminating event was a phone call one morning from my then editor. She told me in a panicky voice she had just seen the latest increase in the price of the glue that book binderies used on the spine. Glue! Would I not AT LAST see sense and take out the required 40,000 words of surplus text? I suppose I do not have to spell out what was my gentle and polite response. In the end The Space Machine appeared in its 117,000-word version on both sides of the Atlantic. It was at that time the longest of my novels, but since then The Prestige, The Separation, The Islanders and now The Adjacent have all been longer. I don’t see any inherent virtue in great length for its own sake – I suppose that I am no different from many other writers, enjoying the freedoms brought to composition by digital technology – but even so my books are by no means the longest around. A few minutes in a bookshop will reveal that my stuff is modest in size, compared with many others. Word-length aside, my books, at least in hardback, are as large as anyone else’s, and larger than some. By large I mean the dimensions of the pages, the binding. The first hardcover novel I ever bought was John Wyndham’s Trouble with Lichen. In 1962 it cost me 13s 6d – 68p today, but in those days a substantial sum because my weekly pay was less than £5 a week. Trouble with Lichen was in the then-standard format for hardback fiction in Britain: 7.5″ x 5″, or what printers and binders call Crown Octavo, or C8. At a mere 190 pages it was probably no more than about 60,000 words long. Wyndham was not at all unusual. 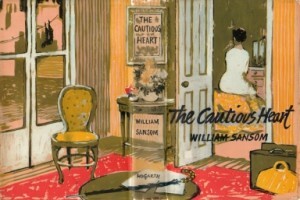 I have just read a novel by William Sansom called The Cautious Heart, published by Hogarth Press in 1958. This was also printed in C8 and at a quick estimate was about 52,000 words in length. It was not just a good novel to read, it was enjoyable to handle the book, with its compact pages, sewn binding, clear letterpress type, and its unlaminated wraparound cover: a painting of a peaceful interior by Charles Mozley. I like to collect books from the 1950s, mostly because I’m interested in the writers of that period (Wyndham, Sansom, Linklater, Shute, Frankau, among others), but also because I enjoy the quality of the books that were printed then. They must have been the ones I used to see in bookshops during the years I was still at school, impossibly beyond my means. When I started acquiring books seriously in the mid-1960s (becoming a reviewer was a help), many hardbacks were still coming out in C8. For instance, most of Brian Aldiss’s early books from Faber were in that format, as were the Gollancz editions of Kingsley Amis’s first books. 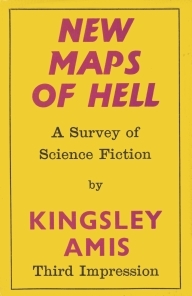 The second hardback book I bought, later in 1962, was Amis’s Gollancz title New Maps of Hell. (16s 0d – 80p.) Perhaps because it was non-fiction it was slightly larger than the Wyndham book, more than half an inch taller and slightly wider. This was Large Crown Octavo (abbreviated to LC8, and it is still the size used for many ‘trade’ or ‘B Format’ paperbacks). By the beginning of the 1970s LC8 had become the usual size of hardback fiction. My first novel, Indoctrinaire, in 1970, was in LC8 format, in common with the rest of Faber fiction at the time (and that of most other UK publishers). All the books I published with Faber, up to The Affirmation in 1981, were LC8. But books were getting bigger again. 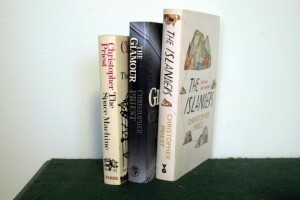 No different from many other titles at the time, The Glamour, 1984, was printed by Jonathan Cape in Demy Octavo (D8, or slightly larger than LC8). Novels these days are even larger: all my books since The Prestige, 1995, have been in M8 format: Medium Octavo, or 9.5″ x 6″. Even the books of my own that I had printed for Grimgrin were in M8 format – there was little choice: M8 was the only size available in that general range. When a book is published the writer is normally consulted on many aspects: the text, of course, the cover illustration, the blurb. But other matters are at the publisher’s discretion: the typeface, the print-run, the publicity budget, the price – and the size of the pages. I sometimes wonder what the thinking must be. I assume it is partly the result of a calculation which involves the word-length, the number of pages, the type size, the costs involved, the anticipated print-run and the projected eventual retail price of the title. Also, I imagine there are practical constraints. Books are no longer printed on flat sheets (folded into ‘signatures’ of 16 pages each, then sewn into a cloth spine – ‘sewn’ binding), but on large rolls, guillotined in order and stuck with glue into a reinforced paper or plastic spine (called in a misleading way ‘perfect’ binding). You no longer see the tiny signature identifier printed at the bottom left of pages 17, 33, 49, 65 … It’s true to say that although I never really noticed them when they were there, now they are absent I rather miss them.